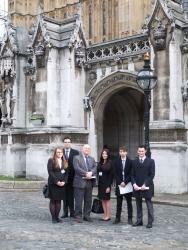 The group, including students Scott Williams, Annabelle Bennett, Thomas Edwards and Bethan Williams, sat in on family and trusts law cases at the Royal Courts of Justice, visited Lincoln's Inn, and were given a guided tour of the relatively new Supreme Court, as well as a question and answer session with the Court Clerks. This was followed by a visit to 25 Bedford Row Chambers to meet Abi Johnson, a criminal defence barrister, for a Q&A session. During the meeting Abi gave the students an insight in to the work of a barrister in London and an overview of her career so far. She also gave the students insightful tips and honest advice as to the path to pupillage for those just starting out on their legal career. As part of the visit, and so as to compliment the mooting students' understanding of how to introduce sources such as Hansard and legislation into their arguments, the group were given a guided tour by the Leader of Plaid Cymru in Westminster, Mr Hywel Williams MP. Mr Williams met the group at Porticus House to give them a guided tour of MPs offices and debating spaces, as well as the many impressive works of arts within the Palace of Westminster. Mr Williams also gave the class first hand insights in to the parliamentary debating process, resources available to MPs, and the process for asking questions in the debating chambers during the drafting of Bills, whilst on their paths to becoming Acts of Parliament. During this visit, Mr Williams arranged for the students to sit in on two Private Members' Bill readings in the House of Commons Chamber: one on Overseas Voters, and another on EU Membership (Audit of Costs and Benefits) Bill. This was followed by a visit to the House of Lords to sit in on their scheduled debates. 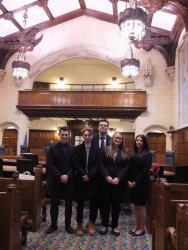 “The students in this class have entered several prestigious national competitions, including the Oxford University Press Moot – where they finished in the top 20 out of 93 in the UK and number one in Wales – and in the Blackstone's Criminal Advocacy Mock Trial Competition, which is still ongoing. He added: “Through meeting senior lawyers and judges, MPs, and experts, and by witnessing what happens in the Highest Courts in the country and in Parliament, students are able to enhance their advocacy skills. “Bangor Law School is very grateful to Mr Hywel Williams MP, Abimola Johnson and the Education Team and Clerks at the Supreme Court for so willingly welcoming us and answering our questions. We look forward to continuing to offer this opportunity to students in years to come”. The students were equally pleased with the outcome of the trip. “Not only has the visit allowed me to gain a greater insight into the legal profession, but I also feel it has helped me to discover interests which I never thought I had, especially through having the opportunity to talk to Mr Hywel Williams MP and Abi Johnson”, said Bethan Celyn Williams. “I found the London trip very beneficial and insightful. We were given key advice on getting into the legal profession when we graduate”, commented Annabelle Bennett.